A great experience! I will definitely recommend them to others traveling through! Great location, beautiful old building, lovely chilled eco vibe. LOVED having a elevator! Expensive but that’s San Fran for you. Cool place to stay on a budget. Good location, awesome staff. The only downside would be no ventilation in rooms and restrooms/showers. All of those spaces are small and confining and no air flow made it pretty uncomfortable at times. But hey, bring a fan or something I guess. The location is quite good, really downtown. There are some homeless people in the area and late at night you may not feel so secure to walk around. The common areas of the establishment are pretty good, with a lot of space and beautiful decoration. There is at least one activity per day that you can choose to join. I did not see many people connecting to each other, but maybe is because I did not spend too much time inside the hostel. 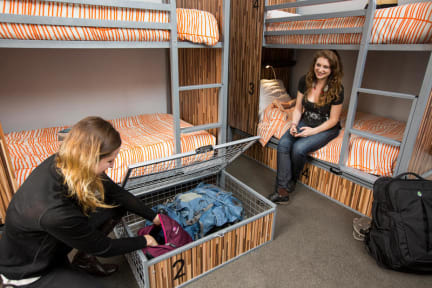 The hostel is located downtown near Union Square which great, however there is outside street noise starting 6 am. If you a light sleeper bring ear plugs, there are sinks in the room but the showers and toilets are in separate rooms each, which are shared with everyone on the floor. The place is VERY CLEAN, cleaners come everyday to vacuum and take out the trash. The kitchen is HUGE plenty of space to cook a full course meal! Overall would stay again, kinda pricey tho however it is SF.